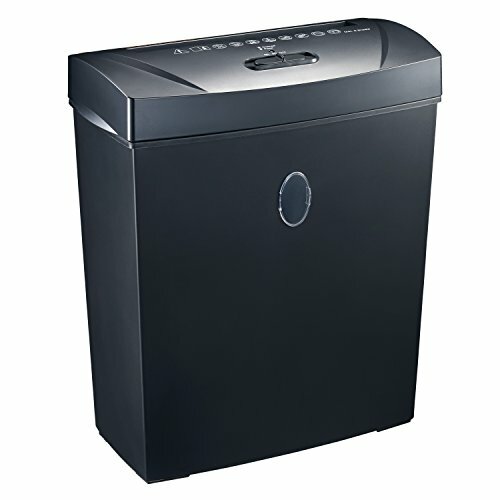 The Bonsaii C170 -A paper shedder provides the best compromise between price and performancet for your home and small office. It can shred your confidential information like bank statements, insurance, and old tax returns up to 8 sheets (A4 size 75g/m 2 ) at a single pass into very small pieces measuring by 1/5 x 1-25/32 inches (5mm x 45mm) (Security Level P-3) to prevent your personal information from identity theft. Convenient small handles on the sides of the shredding head are designed for lifting the shredding part more easily to empty the wastebasket when it is full watching through the clear viewing window in the front. In auto start mode, the shredding begins automatically when the sensor in the middle of the feed slot detects paper inserting. If the shredder is jammed due to shredding exceed paper more than 8 pages, the manual reverse mode can help clear it out. This shredder equipped with an overheating protection system. If the unit keeps shredding over its maximum 2-minutes running time and become overheated, it will shut off automatically to protect the motor. The warranty of this unit is 12 months from the date of first purchase, Please retain your receipt as proof of purchase. Please split thick junk mail or similar documents into batches to shred to keep the shredder in good condition. Cross cut paper shredder with 8 sheets (A4 size 75g/m²) shredding capacity; Shreds paper into 1/5 by 1-25/32 inches (5mm x 45mm);kindly remind: please split thick junk mail or similar documents into batches to shred to keep the shredder in good condition. Fetures auto start and manual reverse to clear paper jams;Thermal protection system to protect motor from overheating.Please kindly don't pull out the rest paper forcibly if the shredder stop shredding due to normally overheated ,it will restart automatically after cooling down. 3.5 gallons wastebasket capacity;transparent basket window makes easy to see when it is full and then do cleaning in time to reduce jam; perfect for light use in home or small office. Backed by 1-year warranty.Please read the User Manual and Troubleshooting Guide carefully before use.